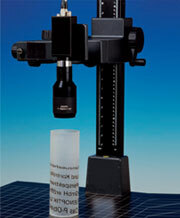 The P-lens 2/6.5 is a special lens for inspecting cavities. It can determine optical characteristics and features on surfaces such as defects or contamination, as well as verify the presence of components. The convenient distance of 35 mm from the entrance pupil to the first lens makes it possible to use the P-Lens to inspect components in fully automated processes. The lens is specially designed to focus (i.e. show contrasts) on curved surfaces in an optimum way. This allows it to make an image of the entire interior of the specimen. The image is reproduced on a standard commercial CCD camera. In this way, images can either be digitally processed or viewed manually on a monitor.